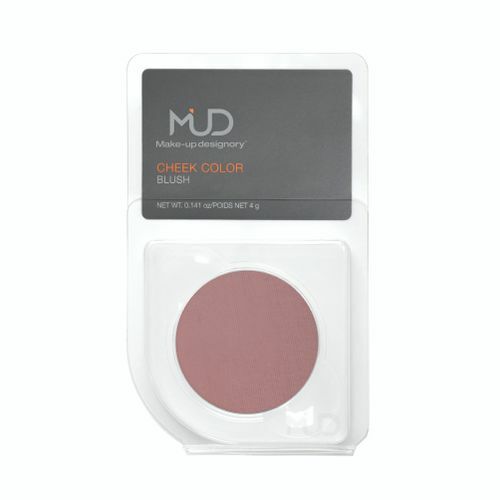 MUD's Cheek Color is formulated with pigment-rich ingredients for a smooth, even finish. This versatile powder is available in a spectrum of beautiful colors from soft and natural to bright and bold. These colors are designed to add warmth and intensity to all skin tones. From a subtle sheen to full on flush, take your pick for an illuminating look. Silky powder formula glides over the skin for a subtle flush of color. Highly pigmented and buildable . Smooth texture and matte finish. Adds a warm, healthy glow to the face. Berry - A soft, warm mauve cheek color/ Adds warmth to light to medium skin tones. Brick - A deep terracotta cheek color/ Ideal for warming up medium to dark skin tones. Bubblegum - A sheer baby pink cheek color. Cool Mauve - A light, muted mauve cheek color/ Ideal for light to medium skin tones. Garnet - A rich red wine cheek color/ Suitable for all skin tones. Gingerbread - A sheer, warm brown cheek color with a subtle shimmer/ Can be used as a bronzer too. Glow - A sheer peach cheek color with a subtle golden shimmer/ Suitable for all skin tones. Poppy - A cool, deep coral cheek color/ Ideal for light to medium skin tones. Pumpkin - A deep burnt orange cheek color/ Ideal for medium to dark skin tones. Rose Beige - A light warm beige cheek color/ Ideal for light to medium skin tones. Rose Petal - A fresh, light pink cheek color/ Ideal for light to medium skin tones. Russet - A deep red-orange cheek color/ Ideal for medium to dark skin tones. Soft Peach - A warm, light peach cheek color/ Ideal for light to medium skin tones. Spark - Sheer, illuminating pearls enhance natural radiance in the skin. Warm Bisque - An extra-light peach-pink cheek color/ Ideal for fair skin.